I came back from Beijing more than a month ago now and before Christian Babski will return next week to China for fabric | ch during another month to finish our residency at the Tsinghua University (until mid July), I'm taking a bit of time to write a follow-up about the short workshop/sketch session I headed there with the students of Prof. Zhang Ga, at the Tsinghua Art & Sciences Media Laboratory. The students originated from many different fields of art, design and sciences and worked in interdisciplinary teams. I must admit that the results didn't really reach my (certainly too high) expectations and ended somehow into too general and a bit precictable projects. Especially because the students didn't have time to go any further than some rough sketches due to parallel academic activities. Nonetheless, the ideas developed during their week of work helped us discuss and clear some paths for our own project. We plan to finish it this summer. The good related news that came out of this is that fabric | ch together with TASML plan to further develop the ideas that surround the subject of our workshop/residency (Deterritorialized Living): we will open a call on different university campuses and art schools in China (Tsinghua and CAFA in Beijing, the China Academy of Arts in Hangzhou and possibly Tongji in Shanghai) for interdisciplinary teams of architects, interaction designers, designers at large, artists and scientists next September. Mainly, this open call, so as our full residency work will become an Associate Project during the next and much anticipated Lisbon Triennale (Close, Closer) co-curated by Beatrice Galilee, Liam Young, Mariana Pestana and Jose Esparza Chong Cuy. The purpose of our residency is to work around a new project in relation with the idea of "deterritorialization", understood in our case as a state of decontextualisation / dislocation / disembodiment / ... triggered by networked services, "clouds" of all sorts and intensive mobility (physical and mediated therefore), as well as through varied artificialization phenomena. The physical figure of the data center appears undoubtedly behind this "state" that interests us, so far mainly (but only) as the infrastructure that holds it. Yet the paradox is, and that's where it probably gets more interesting, that "deterritorialization" is becoming very ambient these days... It's almost a new "context", a geo-engineered one (?) that follows us everywhere: a situation that is always potentially present, somehow proximate. We live in this "context" (too). The intention of our scheme is therefore to consider it and to develop artifacts within this frame of research. At this state of evolution of this specific work, we plan that our residency project will end up into a proposal similar in its form to a previous project we did in collaboration with architect Philippe Rahm, back in 2001 (!) and 2009 (I-Weather): an open platform, a processed and networked atmosphere that everybody will be able to connect to, so to develop their own projects and devices. We hope to deliver an "ambient deterritorialization" in the form of a made atmosphere, the most elementary architecture according to us, that will also act in some ways as an information design about the global state of networks. This atmosphere will then serve us for more elaborate projects and installations. The workshop we held with the students was considering the situation I roughly described above. Yet we decided to shrink it to a managable size: the computers cabinet (which could be considered as a very small, movable data center), but one that would be big enough to become permanently inhabitable though. The domestic inhabitability of this structure for one or two persons becoming part of our design brief. Image of several servers' cabinets taken out of Clog: Data Space (2012). 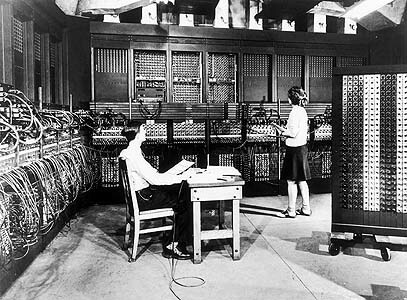 ... and one of the first general purpose computer, the Eniac I, back in 1946. Due to its new "program", this extended computers cabinet would then have to combine some specific physical needs for the machines (i.e. to cool down the servers with fresh air and to expulse hot and ionized air outside, energy supply) and for humans (breathable air, livable levels of heat and humidity, comfort zone, etc. ), possibly while trying to find some symbiosis between them AND to provide the frame for dedicated mediated services. We added a twist to our fictional brief, which was the existence of a second "sun" in the cabinet... In our minds, this second sun would be one of the artifacts we planed to develop in the context of our residency: Deterritorialized Daylight, a permanent daylight, always on yet constantly and slowly varying in its intensity. Step by step storyboard for the workshop: "Inhabiting the computers cabinet, with two suns"
(1, left) 9 square meters (in any shape) to inhabit. Height is free to define. Fresh air surrounds this area. This is the expanded space of the Computers Cabinet. (2, right) A certain number of servers populate this space, along with the person(s) that inhabit it. Machines and humans have to share this place. The space is connected to the nearby and far outsides (by the means of physical and network communications). It provides services of different sorts, physical and digital, local and networked. (3) The 9 m2 Computers Cabinet is part of a larger network of connected cabinets that possibly create a distributed larger structure. (4) The 9 m2 livable Computers Cabinet, with its computers and racks (which modularity, organization and shape can also be redesigned) could be considered as the extension of a regular servers cabinet (5). (6) Fresh air needs to enter the space and cool down the machines. (7) Hot and ionized air comes out of the computers. Not very pleasant to breathe. Ionized air triggers electrostaticity. (8) A natural sun with its natural cycle of days and seasons runs outside. (9) ... as well as a regular night. (10) An "artificial sun" or daylight is also present within the 9 m2 of the Computers Cabinet. It is always "on", yet at different strengths depending on parameters and live feeds. (11) This "sun" is called Deterritorialized Daylight. It's a daylight that is computed, artificial and triggered by the overall user's activities on the networks (both humans and robots). Therefore, it is some sort of reverse daylight: users and their activities/actions, so as other parameters, generate the amount of deterritorialized daylight (it has been historically --or naturally-- the reverse: people getting active when daylight is "on" --until fire, candles, gas and then electricity started to change the rules--). Finally and that was the real purpose of the workshop, we asked the TASML students to develop proposals for this (not so fictional) context. Their projects could be dedicated to the overall situation if they desired, but mostly, we asked them them to think about smaller things that would help interact with the situation and that would take place within it: objects, devices, interfaces, programs, etc. Group #1 (Na Wen, Yin Yiyi, Fang Ke) addressed the complete situation, so as all the 4 groups in fact, and came up with the idea to combine two concepts: the soho (for small office - home office) and the otaku (to my wiki understanding a word that means both "your house" and a person dedicated to an intense individual hobby, recently linked to manga readers and gamers). The computer cabinet would become a space for somebody to live partly retired from the "real" world into his fantasies and some sort of minimal living and self-sufficient space. A screen device was envisioned too which would be understood as an artificial night sky with stars. Only the map of the "stars" would be the one from the location of other cabinets and their brightness their activity. Group #2 (Yang Jieqin, Mou Xinzhu, Zhang Minzhi, Dong Huiyang) focused its attention around a device that converts heat into electricity (note: a "thermopile", but that is not efficient enough yet to be used in everyday situations due to its low performance. So that was fiction too). They thought about transforming the heat coming out of the servers into electricity and therefore produce electricity for the Cabinet (which is not possible today, at least to really power some demanding devices). This heat would also serve to pre-heat the water. Servers were located under the ceiling and were creating therefore a heat zone. The overall proposal was then a self-sufficient space (bio-sphere like) with a cycle of funtions that would follow a logic of distribution from hot > cold, clear water > waste water. The water at the end of the cycle would serve to grow vegetables that would then clean the air, etc. Group #3 (Ao Mengxing, Qian Yunzi, Liu Chang, Zhang Huixin) had an interesting early sketch: they started to design the Cabinet based on the modular system of the actual servers cabinet. Extending it to the 9 m2 size and filling it with other domestic functions. A description of activities happening along time in this space started to suggest that there could be some migration within this space. I suggested they could try a mapping between time, location in the cabinet, functions and possibly heat, while Zhang thought about redesigning the modular aspects of the regular cabinet. These approaches could have triggered a very interesting singular project or dedicated devices I believe. Shame that they didn't continue! Group #4 (Zhang Yingxue, Lin Han, Sun Siran, Tao Lu) combined into one proposal (drawing) each of the four members' approach. The overall design was also a bit into the self-sustainable approach (bio-sphere oriented), yet with different devices: a decorative wallpaper (information design), a wall of vegetables (air cleaning and food production), a game based on a appartment bycycle that would produce electricity and a strange whilpool. ... and finally Group #5 stayed asleep on the day of presentation! All in all, there were some interesting early sketches but that probably stoped too early or went in the wrong direction after the first presentation, into too applied or functional aproaches. That's why we discussed together with Zhang and Cheng Guo (TASML assistant) to plan a public call for students on different campuses, as the theme of work looks quite open for interesting interdisciplinary proposals. (More will follow about this). One group still works on the project though and will deliver its semester work about it.